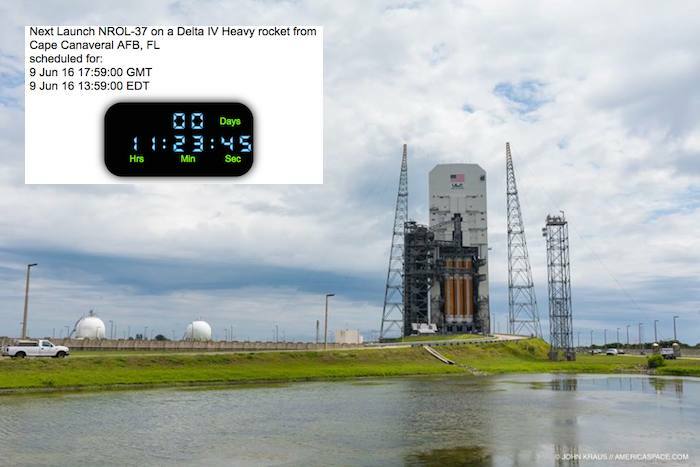 Delta IV NROL-37 Launch ArtworkMay 27, 2016, Update: The NROL-37 Delta IV launch is delayed at the request of the customer. 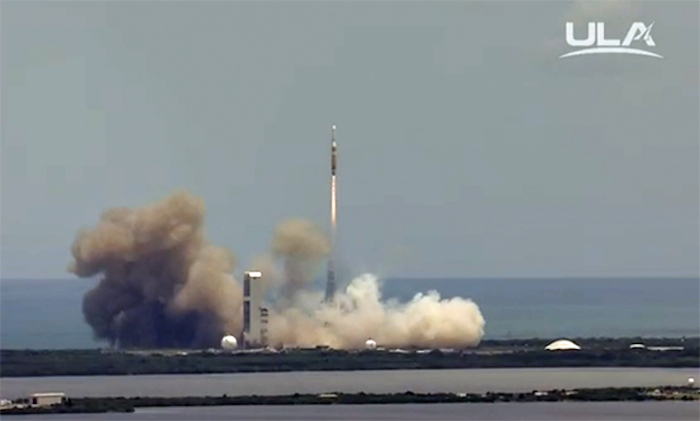 The NROL-37 spacecraft and launch vehicle are secure on Space Launch Complex 37. 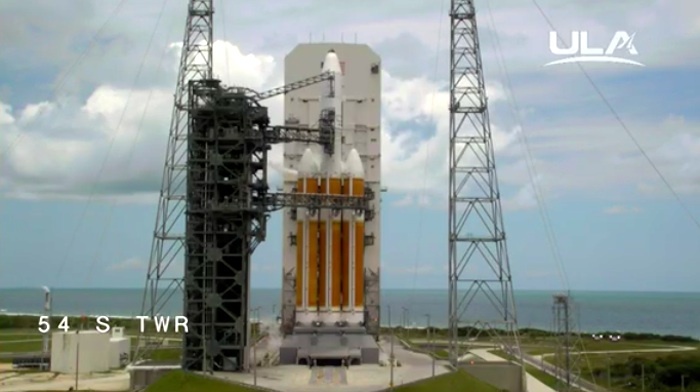 Rocket/Payload: A United Launch Alliance Delta IV Heavy will launch the NROL-37 mission for the National Reconnaissance Office (NRO). Date/Site/Launch Time: Space Launch Complex (SLC)-37, at Cape Canaveral Air Force Station, Florida. 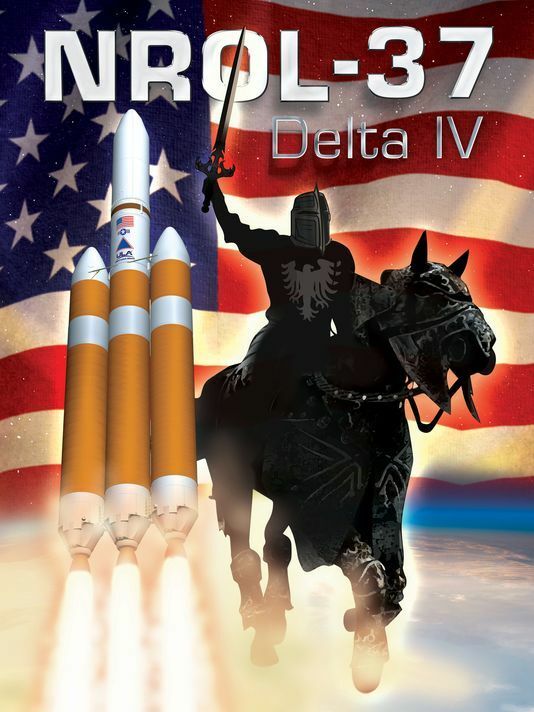 Launch Notes: NROL-37 will be the 32nd Delta IV mission since the vehicle’s inaugural launch in 2002, and the 10th NRO mission to launch on Delta IV. 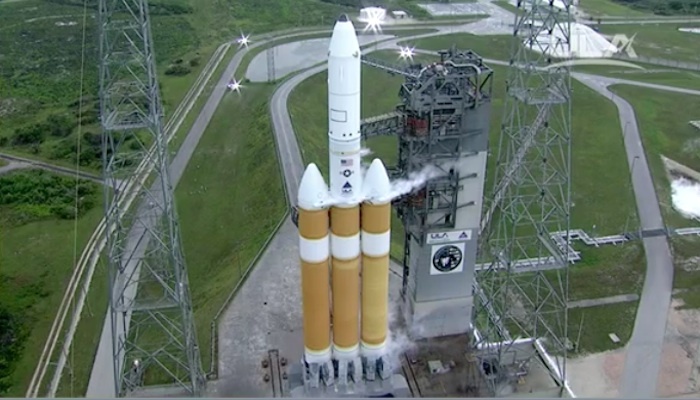 Next Saturday's planned launch of a heavy-lift Delta IV rocket from Cape Canaveral has been postponed. 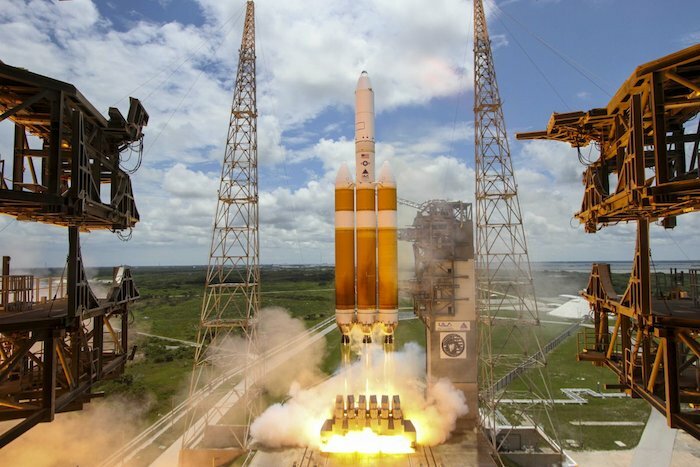 United Launch Alliance on Friday said the mission was delayed at the request of the National Reconnaissance Office, whose classified payload will launch atop the Delta IV Heavy. 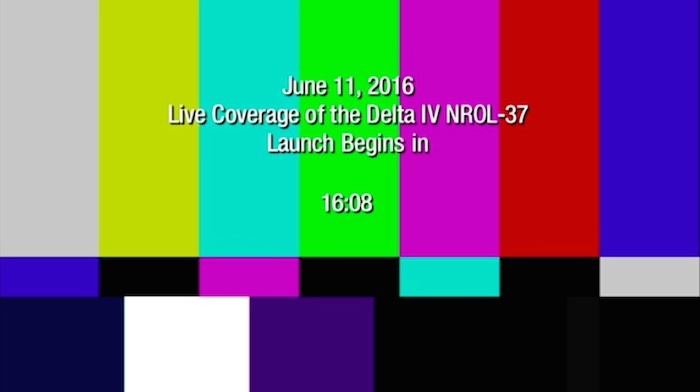 No new target date was announced for the mission labeled NROL-37. 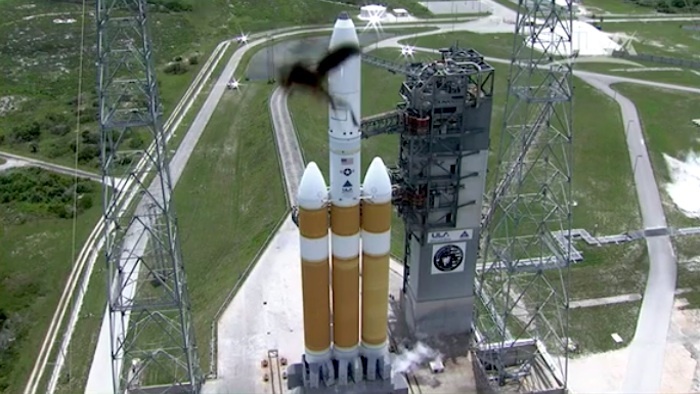 "The NROL-37 spacecraft and launch vehicle are secure on Space Launch Complex 37," ULA said in a statement. ULA simultaneously is preparing for a June 24 launch of an Atlas V rocket and Navy communications satellite from Launch Complex 41. For the third time, a ship carrying the first stage of a SpaceX Falcon 9 rocket is steaming back to Port Canaveral. 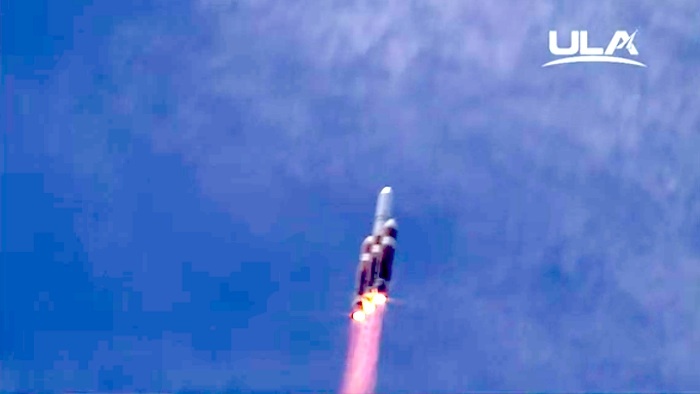 After its 5:39 p.m. Friday launch from Cape Canaveral with the Thaicom 8 communications satellite, the rocket stuck its landing on the modified barge more than 400 miles down range. 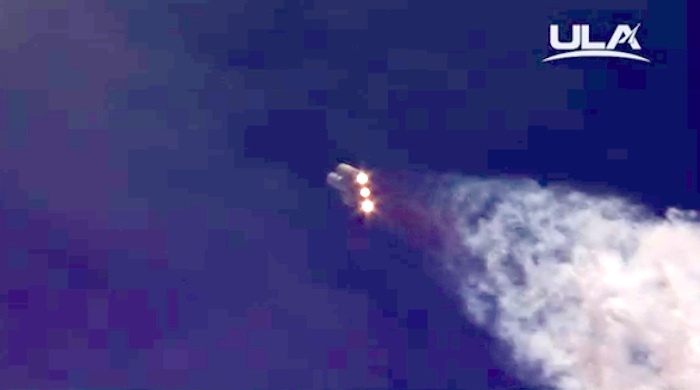 SpaceX CEO Elon Musk said there was a risk the booster could tip over following its relatively high-speed touchdown, but it didn't. Crews boarded the "Of Course I Love You" ship to secure the stage and begin sailing it home. The journey typically takes three or four days, depending on the distance back to port and weather conditions. At Port Canaveral, a crane will offload the rocket stage so it can be transported horizontally to SpaceX's hangar at the base of pad 39A at Kennedy Space Center. 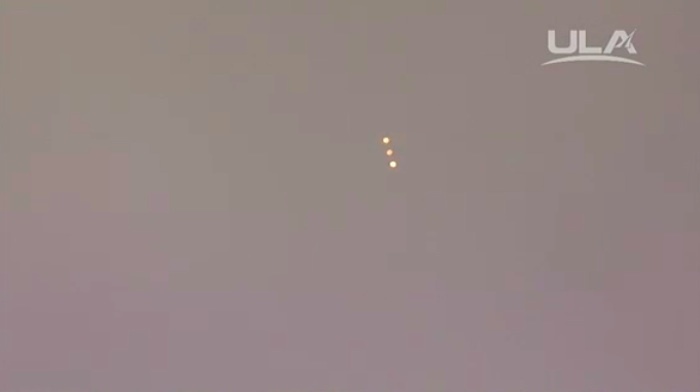 The stage was the third in a row that SpaceX has landed, and fourth overall. The first, in December, landed on land at Cape Canaveral while the last three have been ocean landings. 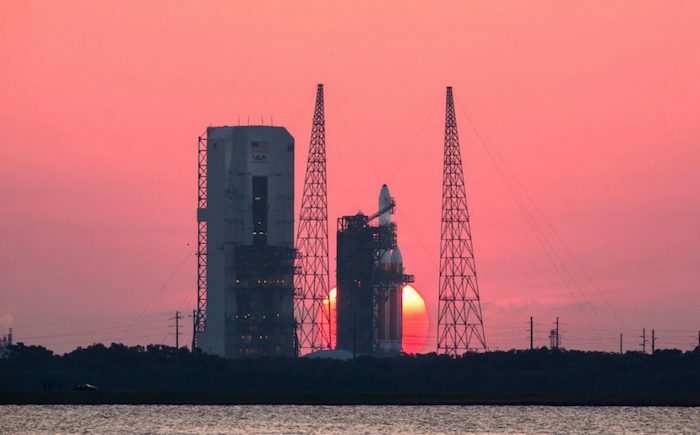 CAPE CANAVERAL — A new launch date has been established — June 9 — for the Delta 4-Heavy rocket to carry a classified satellite into space for U.S. national security needs. 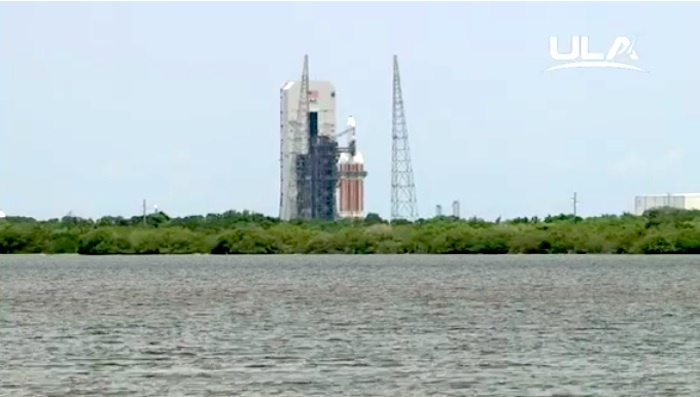 Liftoff of the United Launch Alliance rocket will be possible during a five-hour period stretching from 1:30 to 6:30 p.m. EDT (1730-2230 GMT). 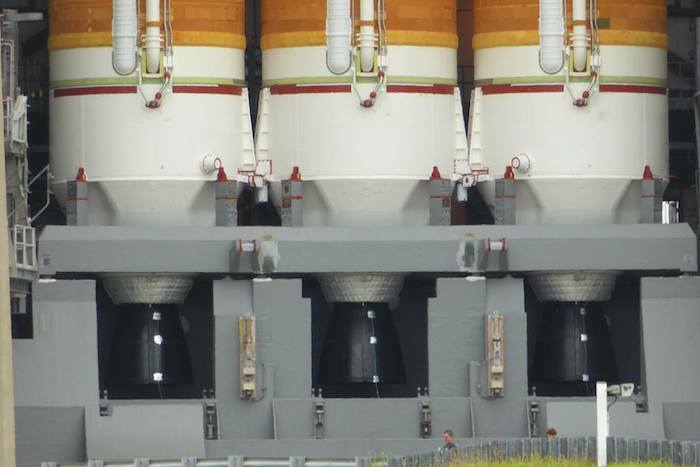 The actual launch window is hidden within that unclassified period. 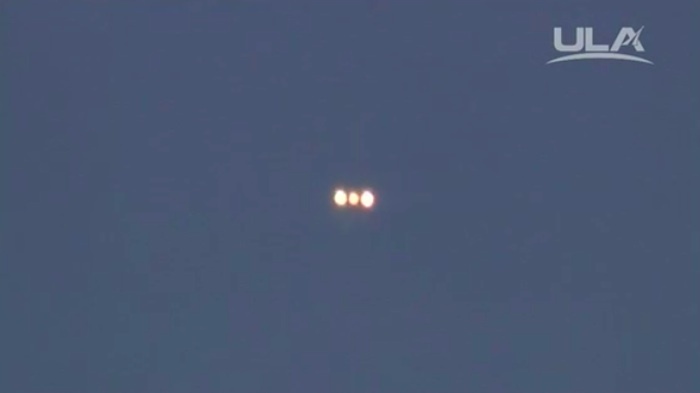 Readiness of the payload delayed the flight from its earlier target of June 4. But given the secretive nature of the spacecraft, no details were publicly revealed about what specifically triggered the slip. 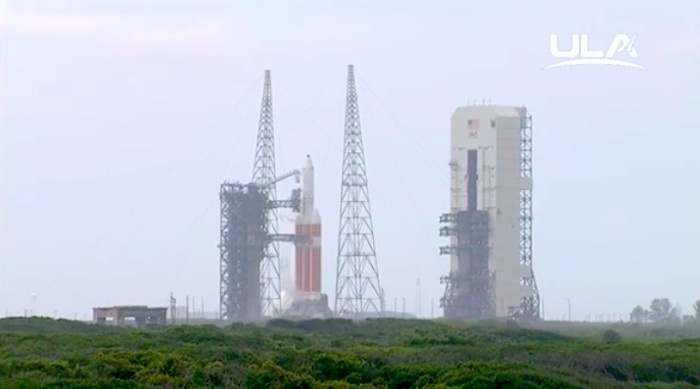 The satellite and rocket are stacked atop Complex 37 at Cape Canaveral Air Force Station for the mission. “The spacecraft, launch vehicle and support systems are ready to support launch,” United Launch Alliance said in a statement to the press today. The launch is being performed for the U.S. National Reconnaissance Office, the agency responsible for the country’s spy satellite fleet. The NRO is a joint organization between the Department of Defense and Intelligence Community. 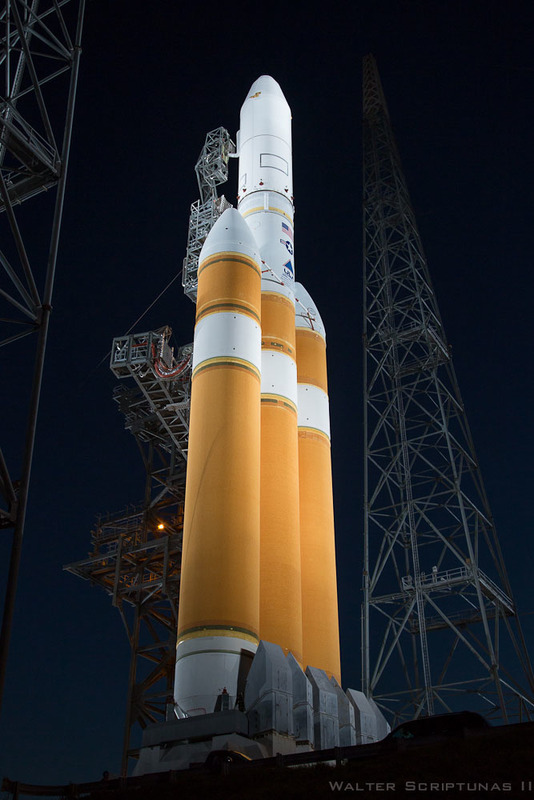 The identity of the satellite launching aboard the Delta 4-Heavy is top-secret. 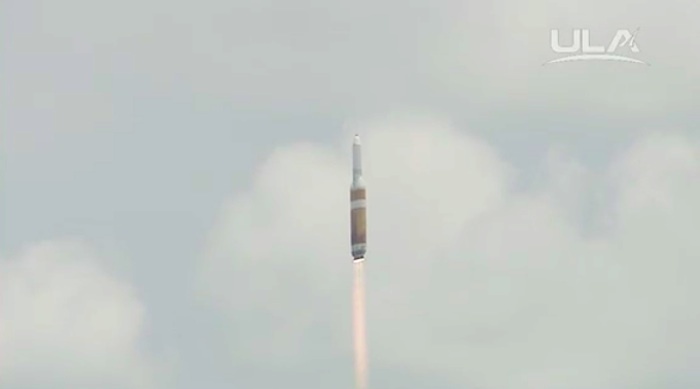 The launch is known as NROL-37. 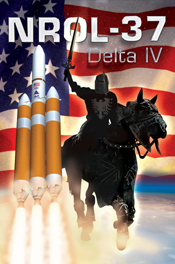 It is the first of five national security space launches scheduled over the next four months, three aboard Delta 4 rockets and two on Atlas 5. After the Heavy, the Navy’s MUOS 5 communications satellite and the NROL-61 mission are planned on back-to-back Atlas 5 launches, then a pair of Delta 4s will launch the second set of Geosynchronous Space Situational Awareness Program, or GSSAP, satellites for U.S. Strategic Command followed by the Air Force’s Wideband Global SATCOM 8 communications spacecraft. 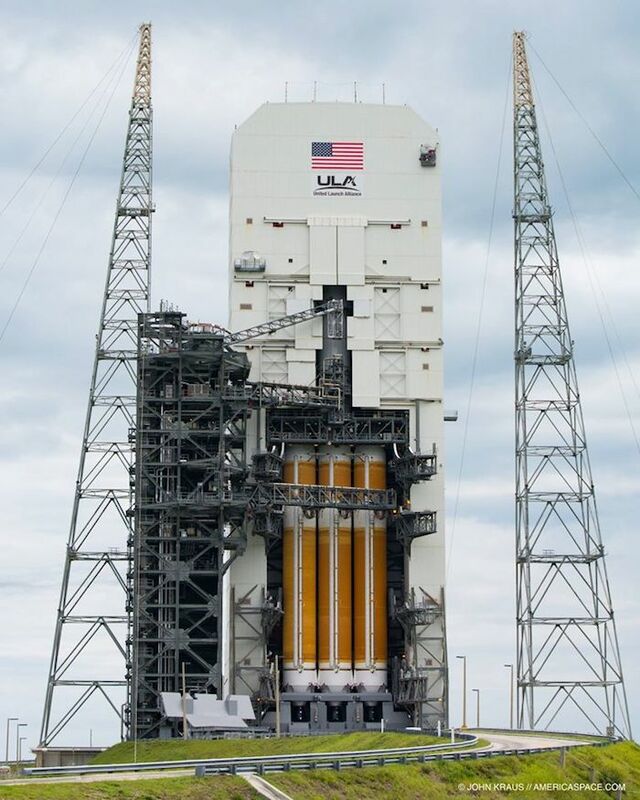 United Launch Alliance is poised to launch its first mission since March, with a heavy-lift Delta IV rocket targeting an afternoon launch Thursday, June 9, from Cape Canaveral Air Force Station. 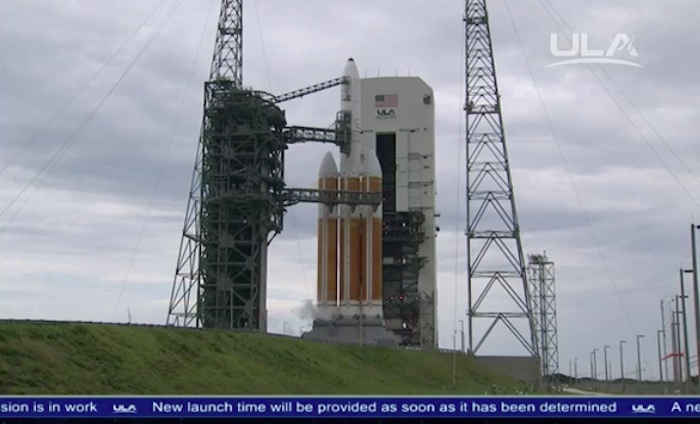 Liftoff from Launch Complex 37 is planned between 1:30 p.m. and 6:35 p.m. A more precise launch window will be released before then. 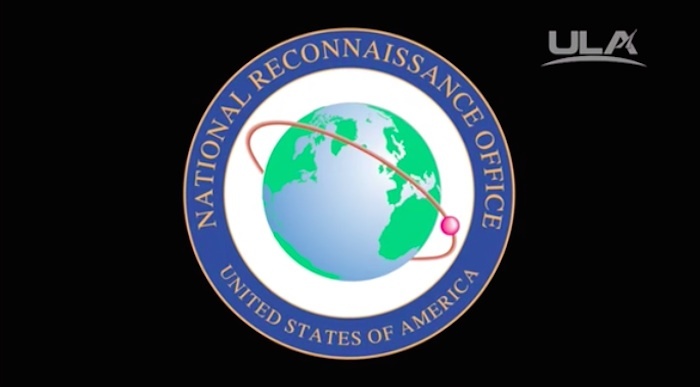 The classified National Reconnaissance Office mission was delayed five days due to an unspecified issue with the payload. 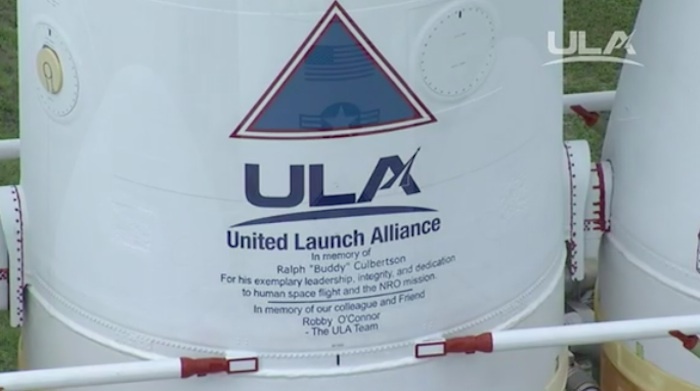 ULA on June 2 confirmed the launch was "go" to proceed a week later. "The spacecraft, launch vehicle and support systems are ready to support launch," the company said in a statement. 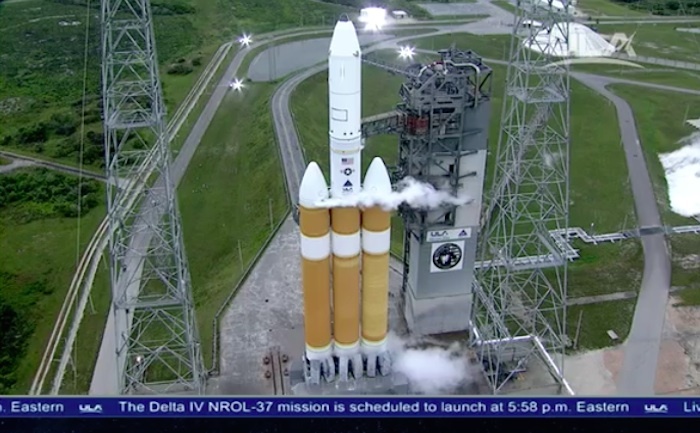 The launch will be the 32nd by a Delta IV rocket and ninth by a Delta IV Heavy, whose three core boosters generate 2.1 million pounds of thrust at liftoff. CAPE CANAVERAL — After tropical weather passes through Florida to start the week, meteorologists say there is a 40 percent chance of acceptable conditions for the United Launch Alliance Delta 4-Heavy rocket to fly Thursday from Cape Canaveral with a reconnaissance satellite payload for the U.S. government. Tropical Storm Colin, which formed Sunday over the southern Gulf of Mexico, will make its way northeastward today, bringing its center ashore in the Big Bend area of Florida. Along the Space Coast, heavy rains are expected through Tuesday and a tropical storm warning is in effect for the beaches. 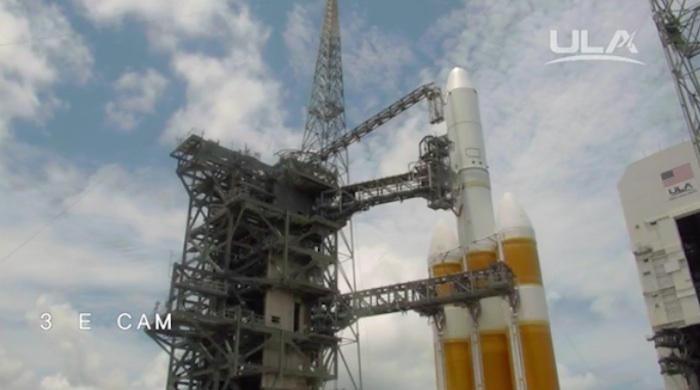 The Delta 4-Heavy rocket and its classified National Reconnaissance Office payload are safe and secure within the protective gantry at Complex 37. “Weather will improve Wednesday, but Thursday a trough to the south will migrate north over the Space Coast causing a risk of showers and thunderstorms beginning as early as noon and continuing into the afternoon,” Air Force launch meteorologists reported today. 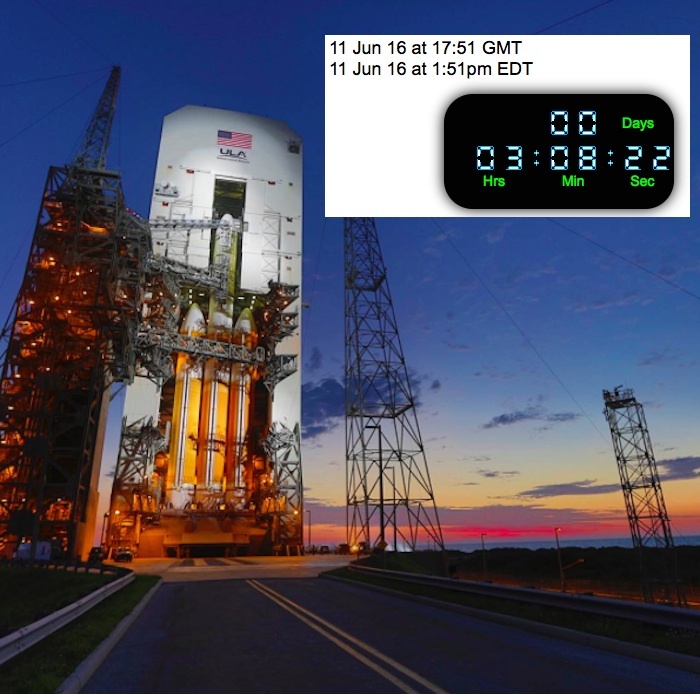 Thursday’s liftoff will happen some time between 1:30 and 6:30 p.m. EDT (1730-2230 GMT). Winds will be easterly at 12 gusting to 18 knots and temperatures will be in the mid-80s F.
If the launch is scrubbed, another flight opportunity will be available Saturday. The outlook improves to 80 percent “go” odds then. “In the event of a 48-hour delay, weather improves significantly as the boundary moves south and dryer air aloft moves in. 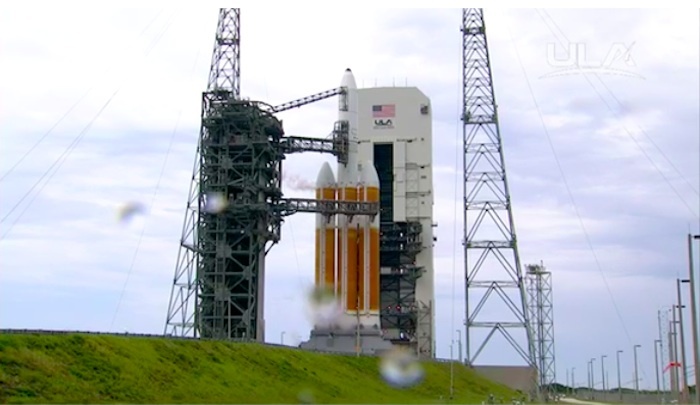 The primary concern for a 48-hour delay is thick cloud,” launch forecasters said. The biggest spacecraft in the world—a top secret $1.7 billion National Reconnaissance Office (NRO) Mentor/Advanced Orion eavesdropping satellite—is ready for launch from Cape Canaveral AFS as soon as June 9 at 1:59 pm EDT, on board the most powerful operational rocket in the world, a$375 million United Launch Alliance (ULA) Delta IV Heavy. 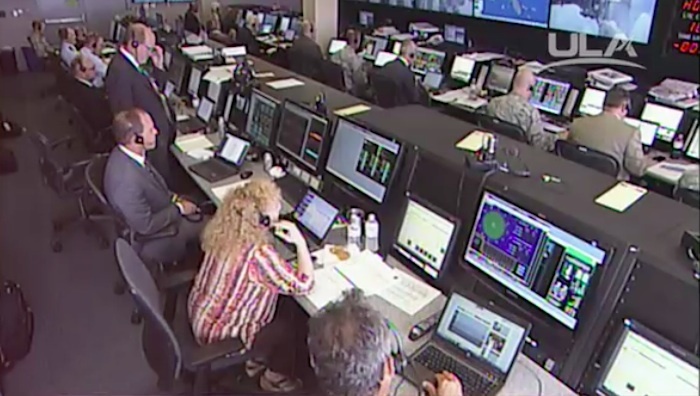 Carrying a mammoth eavesdropping antenna spanning 330 feet, the Mentors “are the largest satellites ever launched,” said Air Force 4-star Gen. Bruce Carlson (ret), who headed NRO from 2009-2012. NRO-37The nearly 6-ton NRO 37 Mentor/Advanced Orion spacecraft being launched is a Crown Jewel of America’s top secret intelligence satellite operations. This is because of its importance to national security from its signals and electronic intelligence intercepts for the National Security Agency (NSA); Central Intelligence Agency (CIA); Defense Intelligence Agency (DIA); and for Army, Navy, Air Force, and National Command Authority intelligence operations. 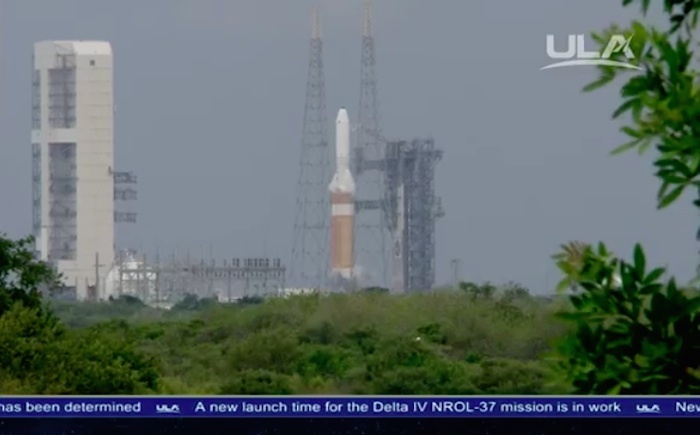 Local and national news media will briefly cover (or not cover) the NRO 37 mission as if it is a routine shot. But this over $2 billion mission is far from routine. 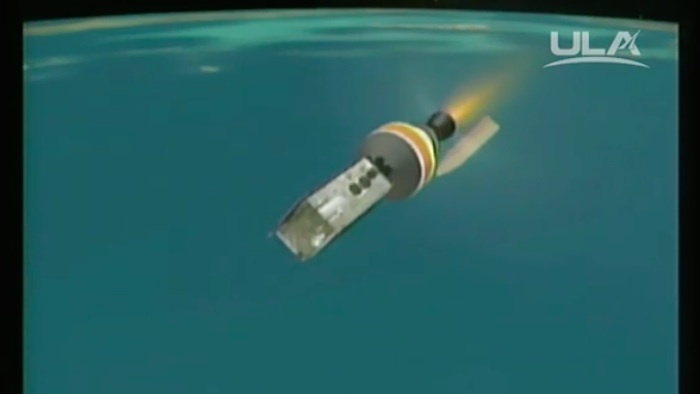 The Mentor/Advanced Orion spacecraft provides unique and vitally important intelligence by listening to Middle Eastern Adversaries, such as ISIS, and political and military officials in China, North Korea, Russia, and other countries. The satellite will also listen-in to telemetry from foreign missile tests, especially key intelligence from North Korea, China, and Russia, which are all developing multiple new missiles with which to threaten the U.S. on land, sea, and in the air. The NRO long ago developed the ability to listen to Chinese and Soviet/Russian leaders in their offices and cars. But as technology has advanced such eavesdropping has become far more complex. Much of the intelligence received is coded, requiring extensive efforts at NSA to break it. 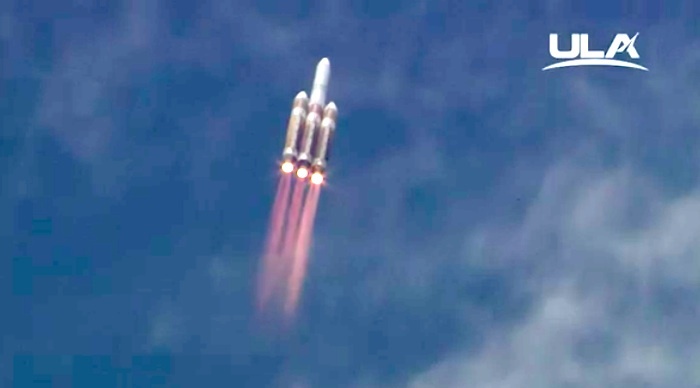 In addition to its intelligence data, the NRO Mentor and ULA/USAF Delta-IV Heavy programs fund hundreds of ULA jobs across the U.S. and at the Cape’s 45th Space Wing. In fact the Delta-IV Heavy rocket was developed primarily for launching advanced Mentor/Orion spacecraft directly into geosynchronous orbit. It also launches advanced Crystal KH-11 type digital imaging satellites into medium altitude polar orbits. Locally, the Harris Corp. in Melbourne, Fla., has received hundreds of millions of dollars in NRO funding for the football field-sized dish antenna on each Mentor/Advanced Orion spacecraft. 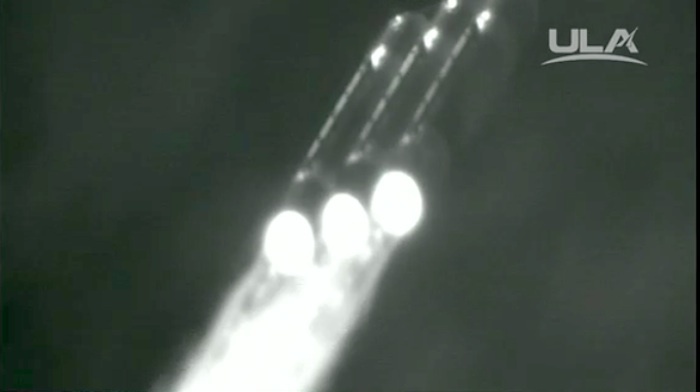 So far eight Orion and Advanced Orion Mentors have been launched carrying the huge Harris antennas. These Harris antennas involve some of the country’s most advanced highly protected technologies. The prime contractor for previous versions of the Advanced Orion/Mentor spacecraft was TRW/Northrop Grumman Corp. (NGC), and it is likely NGC remains the lead contractor. 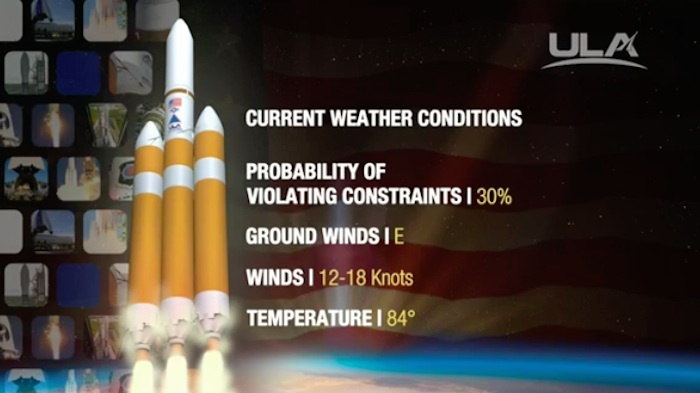 The weather for a Thursday launch attempt is predicted to be 60 percent unfavorable, with clouds and thunderstorms a possibility throughout the day. 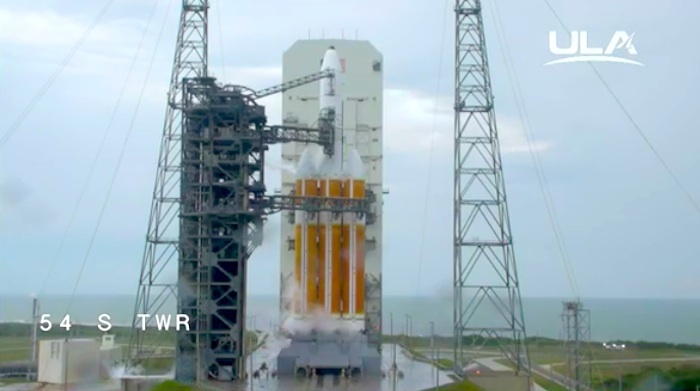 If weather or technical issues force tomorrow’s launch to be scrubbed, the next opportunity to launch the NRO mission will come Saturday, June 11. The 48-hour turnaround requirement is caused by Eastern Test Range requirements to support the “Return to Flight” at the Wallops Flight Center of the Orbital ATK Antares rocket, which now sports two new Energomash RD-181 engines. 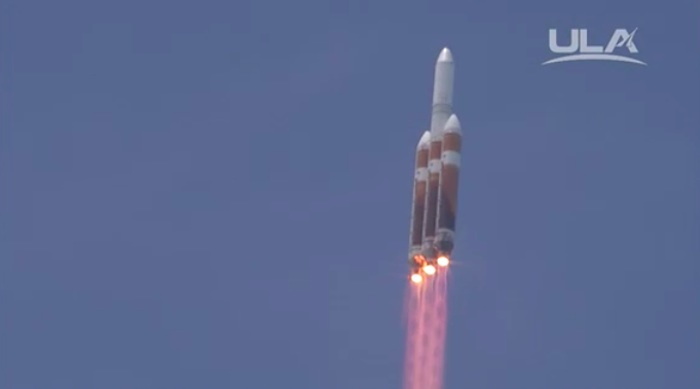 The Delta-IV Heavy NRO 37 mission will lift off on 2 million pounds of thrust, generated from its three RS-68A engines in the triple core launcher. They will propel the Delta-IV Heavy off Launch Complex 37B on a trajectory that will place the satellite directly into geosynchronous orbit. 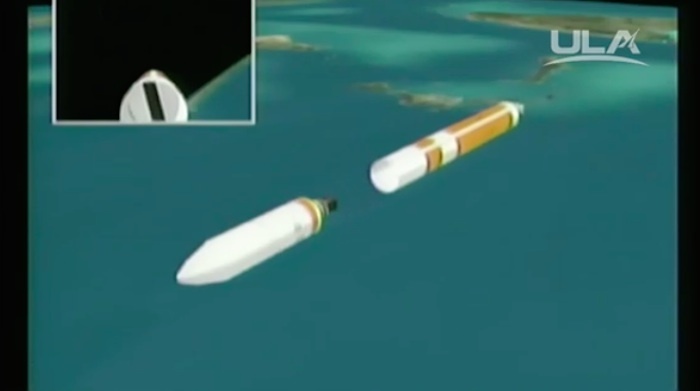 That location remains secret, but it will join three other Mentor/Advanced Orions launched by Delta-IV Heavies since 2009. At liftoff Each oxygen/hydrogen powered RS-68A will produce 705,000 lbs thrust—30 percent more than each Space Shuttle Main Engine generated. The launch milestone chart below shows the approximate timing of NRO-37 ascent milestones, including the three burns by the Delta IV Heavy’s upper stage powered by a 25,000 lb-thrust RL-10-B-2 engine. The exact ascent milestones must remain secret to avoid Russian and Chinese precision tracking. But the chart was originally prepared for the Initial Delta IV Heavy flight test with the initial RS-68 versions. 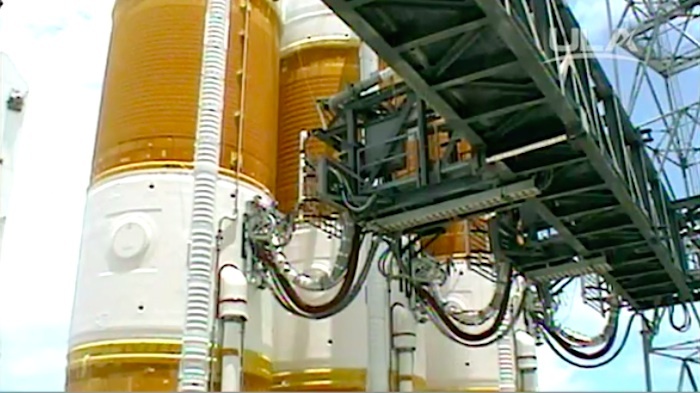 It uses a two burn upper stage test profile. —Initial second stage engine cutoff is predicted to result in a 190 x 244 Km. (118 x 151 mi.) orbit . —Second upper stage cutoff orbit is predicted by Molczan to be in orbit at 212 x 35,809 km. (132 x 22,250 mi.). 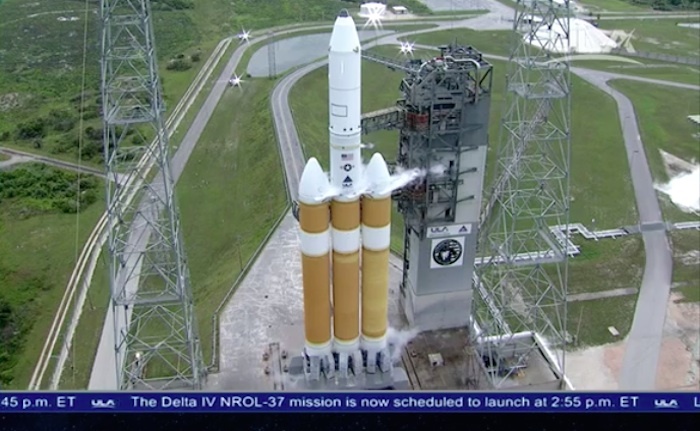 —Third upper stage burn is predicted to achieve a 35,746 (22,211 mi.) geosynchronous orbit. Delta IV NROL-37 Launch ArtworkCape Canaveral Air Force Station, Fla. (June 9, 2016) - The ULA Delta IV NROL-37 launch scrubbed for the day due to violation of multiple launch weather criteria. 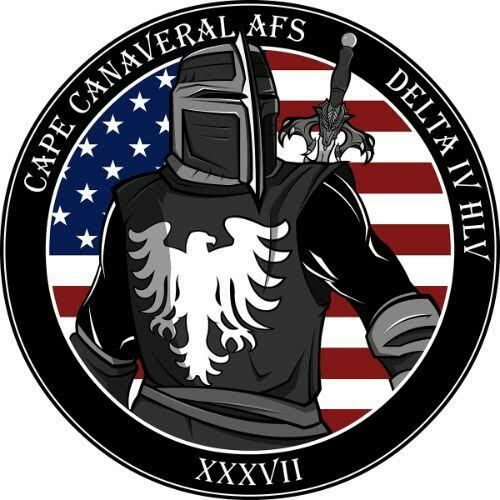 The Delta IV NROL-37 is scheduled to lift off on Saturday, June 11 at 1:51 p.m. from Space Launch Complex 37 at Cape Canaveral Air Force Station in Florida..
Date/Site/Launch Time: Saturday, June 11, 2016, from Space Launch Complex (SLC)-37 at Cape Canaveral Air Force Station, Florida. 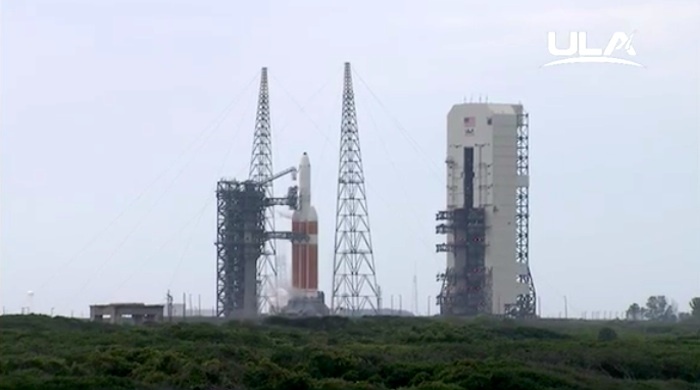 Launch is planned for 1:51 p.m. EDT (17:51 GMT). Webcast: The live broadcast will begin at 1:31 p.m. EDT. Launch Updates: To keep up to speed with updates to the launch countdown, dial the ULA launch hotline at 1-877-852-4321 or join the conversation at www.facebook.com/ulalaunch, twitter.com/ulalaunch and instagram.com/ulalaunch; hashtags #NROL37 and #DeltaIV. 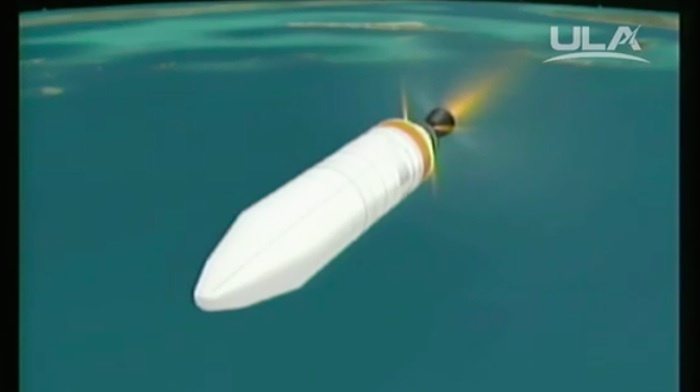 Burning three tons of liquid oxygen and hydrogen fuel per second, the rocket quickly lost weight and accelerated, arcing away to the east over the Atlantic Ocean on a trajectory typically used to put satellites in high "geosynchronous" orbits where they circle the globe in lockstep with Earth's rotation. Liftoff came two days after a launch scrub Thursday because of extensive showers, thick clouds and electrical activity across southern Florida. More of the same was expected Saturday, but no storms were in the area at launch time, and mission managers cleared the 1.6-million-pound rocket for flight. 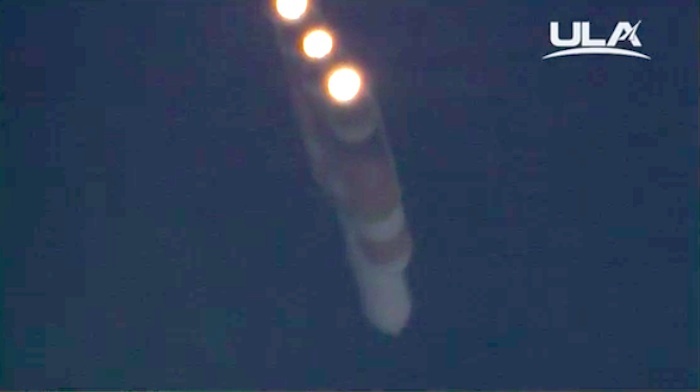 Four minutes after liftoff, now well out of the denser lower atmosphere, the Delta 4's two strap-on Common Booster Core engines throttled back and shut down. 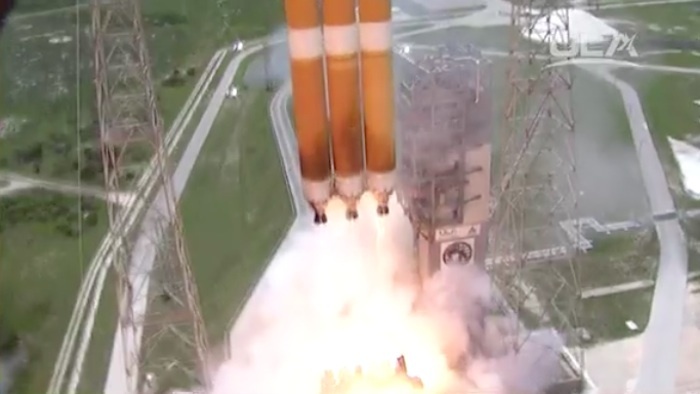 The side boosters then were jettisoned and the Delta 4 continued the ascent on the power of its central CBC engine. A minute and a half later, that engine shut down as planned and the stage fell away. 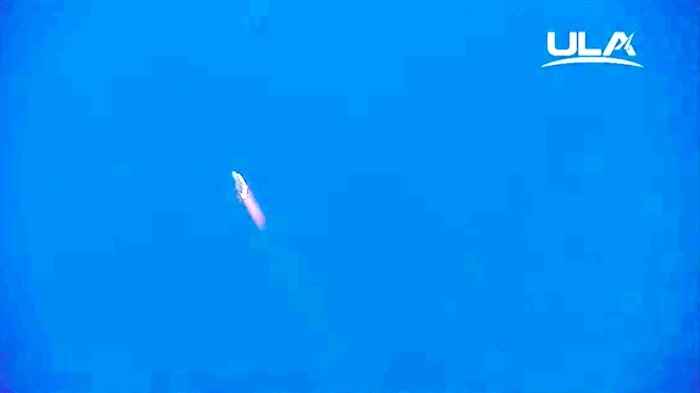 The rocket's second stage engine, an Aerojet Rocketdyne RL10B2, ignited seconds later and the nose cone fairing protecting the satellite payload was jettisoned as planned. 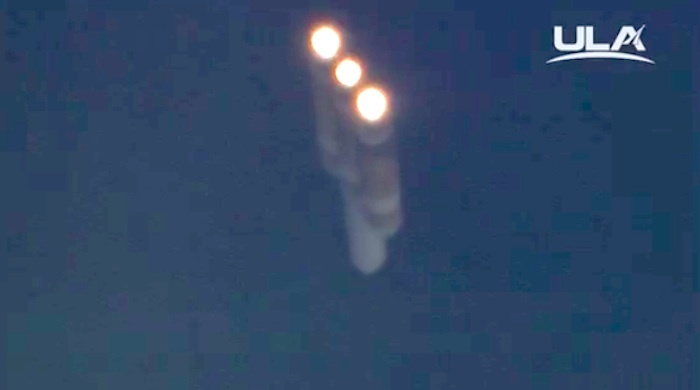 But as usual with launchings involving classified payloads, United Launch Alliance ended its mission commentary at that point "at the request of our customer," and the rest of the Delta 4's ascent was carried out in secrecy. 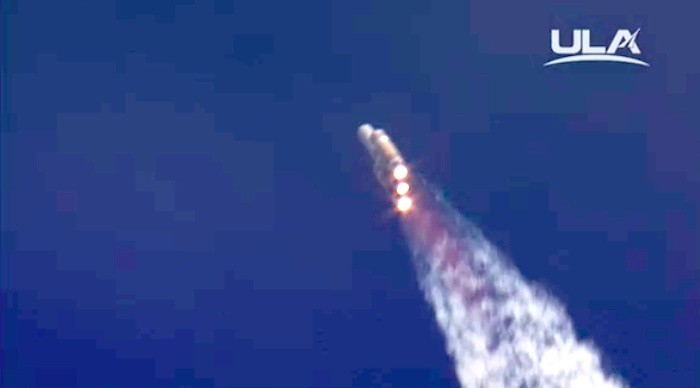 No details about the rocket's payload were released by the Air Force or the National Reconnaissance Office. But Ted Molzcan, a respected amateur satellite analyst who coordinates worldwide observations of military and civilian spacecraft, believes it likely was a Mentor signals intelligence satellite equipped with a huge, unfolding mesh antenna that can pull in all manner of electronic data and communications. 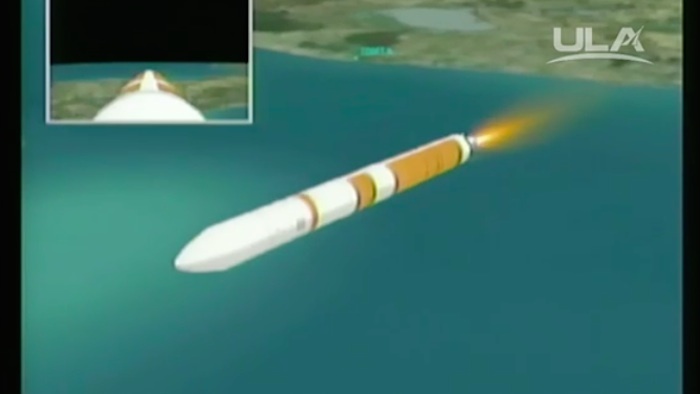 "If the NRO is the customer and it's a Delta 4-Heavy out of Florida, then all of the precedents have been heavy signals intelligence-type satellites," Molczan told CBS News. "One of the common code names that people use that, I guess, leaked out some years ago is Mentor. Sometimes it's also called Advanced Orion." But that's only an educated guess, he said. "Until you see where it actually goes and what it does, you can't totally rule out the possibility that it'll be something different," he said. "But I think it's a pretty good bet that's what it is." 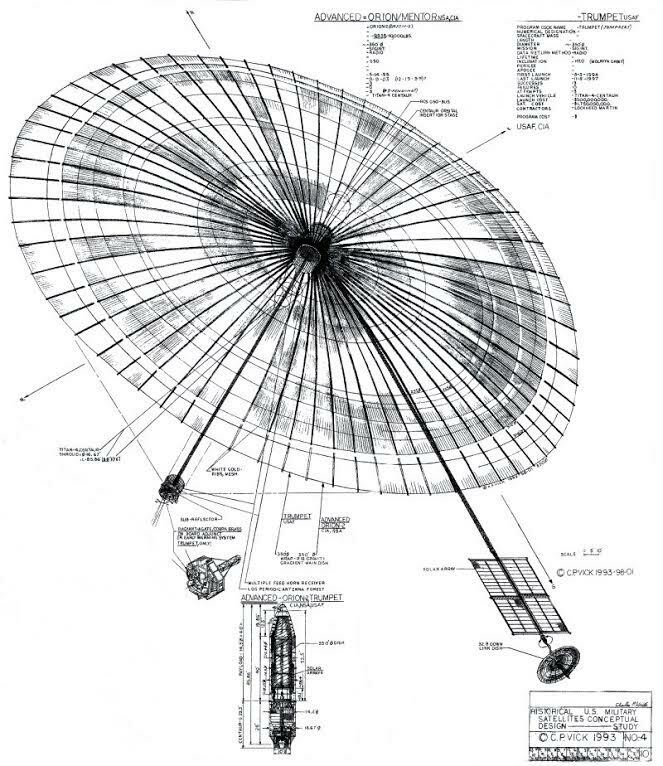 Matthew Aid, author of "Intel Wars: The Secret History of the Fight Against Terror" and "The Secret Sentry," a history of the National Security Agency, said the six-ton Mentor satellites -- if, in fact, one was on board the Delta 4 -- feature the largest antennas ever used in space. "Details of how Mentor satellites operate (are) highly classified, but they are known to pick up a large number of electronic signals from ships, aircraft and ground stations, as well as other satellites," he writes on his web page. "This data undergoes some processing on the Mentor satellite, is then encrypted and transmitted to American ground stations for further analysis." In any case, Mentor satellites are relatively easy for space sleuths to track, thanks to the sunlight reflected by their huge antennas, believed by some to be more than a football field across. "Several of the Mentors have been observed by my colleagues who are able to track these things visually and optically," Molczan said. "For geosynchronous birds, they're quite bright." Unlike commercial communications satellites, which appear very dim and require telescopes to spot in their geosynchronous perches 22,300 miles above the equator, Mentors are within the reach of good binoculars. "If you had a little bit bigger binoculars, like 11-by-80s, and you're in a part of the world where they're in your line of sight, then you'd be able to spot them without any difficulty at all," Molczan said.